I'm in the process of building a Debian FreeRadius server that does 802.1x authentication for domain members. I would like to sign my radius server's SSL certificate (used for EAP-TLS) and leverage the domain's existing PKI. The radius server is joined to domain via Samba and has a machine account as displayed in Active Directory Users and Computers. The domain controller I'm trying to sign my radius server's key against does not have IIS installed so I can't use the preferred Certsrv webpage to generate the certificate. 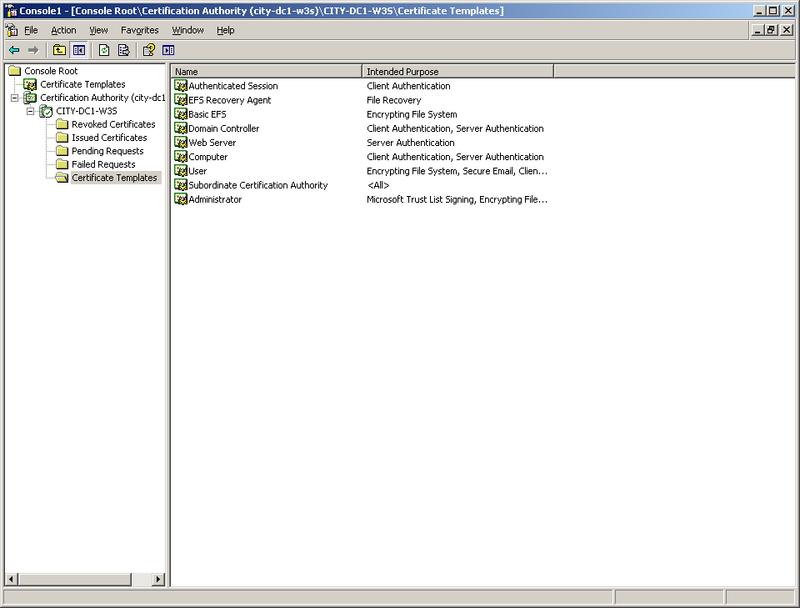 The MMC tools won't work as it can't access the certificate stores on the radius server because they don't exist. This leaves the certreq.exe utility. My certificate authority has the following certificate templates available. If I try to submit by certreq.exe using "CertificiateTemplate:Computer" instead of "CertificateTemplate:Machine" I get an error reporting that "the requested certificate template is not supported by this CA." My google-foo has failed me so far on trying to understand this error... I feel like this should be a relatively simple task as X.509 is X.509 and OpenSSL generates the .CSRs in the required PKCS10 format. I can't be only one out there trying to sign a OpenSSL generated key on a Linux box with a Windows Certificate Authority, so how do I do this (perferably using the off-line certreq.exe tool)? kce, what the previous poster is hinting at is to verify the properties of the Machine template. It can be found at the 'Certificate Templates' snap-in. Find that template's properties and on the 'Subject Name' tab are the settings on how the Subject Name should be provided to the CA (e.g. 'Supplied in the request' or 'Built from information in Active Directory'. Not the answer you're looking for? Browse other questions tagged windows-server-2003 debian openssl radius certificate-authority or ask your own question. Is it possible to include the private key in an openssl-generated CSR? How to convert a SSL certificate and private key to a PFX for import in IIS?